Your Dentist in Danville Says Flossing Can Save Your Smile! When you visit your dentist in Danville, do they give you the side eye because you told that same old fib—that you floss every single day. Believe it or not, your dentist can tell when you’re telling a white lie and telling the truth—especially when it comes to flossing. For more reasons than one, flossing is a critical part of your home hygiene routine. Learn more about why your dentist always encourages you to keep regular flossing habits at home in this week’s blog post. When you look at your typical floss, you might not think it’s anything special. It’s just some silly string, right? Wrong! Floss—no matter what type you use if you use it the right way—is one of the most helpful dental tools that you can have in your dental toolkit. Removes leftover plaque from between teeth and along the gum line. Prevents tartar buildup from between the teeth. Keeps the gums firm, strong, and healthy. Wards off dental diseases like gum disease. Not only that, but your dentist doesn’t have to meticulously scrape away hardened plaque and tartar from the crevices of your teeth during your dental visit. This can make for quicker, more enjoyable dental appointments! Imagine all the plaque that’s built up between your teeth when you skip flossing for an extended period? You’re missing up to 35% of your teeth’s surface! These lingering harmful materials can lead to dental problems like gum disease. Little do many people know, your gums do a lot for your whole body’s health! The least you can do is avoid gum disease by flossing every day. Unfortunately, many people still skip this part of their dental routine and start to experience symptoms like sensitive teeth, bleeding gums, inflammation of the gum tissue, and even gum recession. If you don’t improve your flossing habits and consult a dentist for your potential gum disease, you could risk losing your teeth! How can you improve your flossing habits now? Hopefully, the threat of gum disease or losing your natural teeth is enough to make you want to improve your dental hygiene routine. If flossing seems like a daily challenge, you don’t have to settle for traditional floss. Ask your dentist for assistance when choosing the perfect tools. They might recommend a water pik to make your flossing easier to complete and more entertaining. Or, they can demonstrate how proper flossing should look during a scheduled appointment. To learn more about flossing and how to boost your oral health, give your local dentist a call today. Here at Danville Dental Associates, we know that were just one half of a team that takes care of your smile. 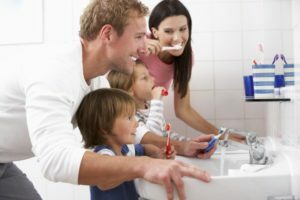 You must prevent dental problems at home, too! That’s why we make it a priority to teach you the best dental hygiene techniques in our office so that you can improve your smile from the comfort of your own home. Learn more about how we may be able to help you by contacting us today. Comments Off on Your Dentist in Danville Says Flossing Can Save Your Smile!